Make sure the water supply valve is fully open. The Flush Rod (I) or push button should not interfere with the Actuator. The proper clearance should be approximately 1/8" when the push button or flush-handle is stationary. On push button type fixtures, loosen the setscrew on the Actuator (see F on the component list) and rotate the Actuator up (counterclockwise) or down (clockwise) until the proper clearance is obtained. For flush-handle fixtures, observe the clearance. (See Figure 1) If necessary, adjust the Actuator to allow for proper clearance. When proper clearance is obtained, tighten the setscrew. Flush the toilet to relieve the pressure. Examine the inlet screen and remove anything that may be blocking the flow of water into the FLUSHMATE® tank. Reattach water supply line and fully open water supply valve. Test setup by flushing toilet. 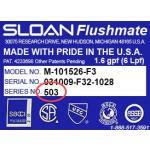 Remove, examine, and reinstall the Flush Valve Cartridge (3). Turn off the water supply valve and flush the toilet to relieve the pressure. On flush-handle fixtures, disengage the Flush Rod from the handle linkage and flip it away from the Flush Valve Cartridge. It is not necessary to loosen the retainer clips. (See Figure 3) Remove the Flush Valve Cartridge using the handles of a pair of pliers. (See Figure 2). Turn the Flush Valve Cartridge counterclockwise until you can lift it out of the FLUSHMATE® tank. Insert the Flush Valve Cartridge into the FLUSHMATE® tank and thread it clockwise into place until one (1) black thread (on the FLUSHMATE® tank) is showing above the Flush Valve Cartridge. (See Figure 5) Fully open the water supply valve and continue to thread the Flush Valve Cartridge clockwise, 1/4 turn at a time, pausing briefly between each 1/4 turn, until the water stops running into the toilet bowl and the FLUSHMATE® tank pressurizes. Test setup by flushing toilet. Reinstall Flush Rod and handle linkage. Inadequate water pressure, an improperly adjusted Flush Valve Cartridge, a clogged inlet screen, or insufficient air draw may cause a weak, sluggish, or no flush condition. Make sure that the water supply valve is fully open. Check for proper actuation adjustment, see Condition A-2, "Water runs and will not shut off." Make sure the water supply valve is turned off and the toilet has been flushed to relieve the pressure. Remove the Duckbill Valve from the Air Inducer Cap. (See Figure 10) The flat "lips" of Duckbill Valve should open fully when the square sides are squeezed together. (See Figure 11) Rinse any obstruction or mineral deposits from the Duckbill Valve. If the Duckbill Valve is damaged, it must be replaced. Reconnect the water supply line and fully open water supply valve. Check the Flush Valve Cartridge for leaks. Pour a small amount of water into the Cartridge housing area. (See Figure 16) If bubbles are coming from the center or the edge of the Flush Valve Cartridge, it should be replaced. If the Vacuum Breaker (E) is leaking, it is likely that the water pressure is insufficient or that there is insufficient flow due to a plugged inlet screen in the lower Supply Shank. The recommended static pressure for the 503 Series is between 20 psi and 125 psi and for the 504 Series between 25 and 125 psi.